Both groups showed similar weight loss, but the HIIT group showed a 2 percent loss in body fat while the steady-state group lost only 0.3 percent. The HIIT group also gained nearly two pounds of muscle, while the steady-state group lost almost a pound. 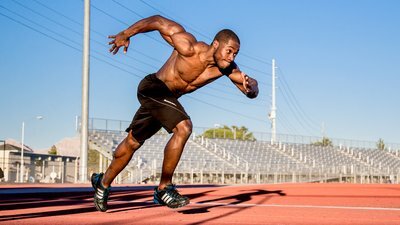 Since the mid-1990s, scores of studies have shown the effectiveness of interval conditioning for fat loss. One Canadian study compared the fat-loss effects of interval training versus a traditional, slow cardio regimen. The traditional regimen burned twice as many calories as the interval regimen, but those who performed intervals lost more body fat. More recently, a study in the "Journal of Obesity" showed that 12 weeks of HIIT reduced body fat and increased muscle mass. There were also substantial reductions in total abdominal trunk and visceral fat, and increases in lean body mass and aerobic power. The most surprising aspect of the results was that the subjects' diets remained the same. One of Tabata's most famous findings demonstrated that 20 seconds of all-out cycling followed by 10 seconds of low intensity cycling for four minutes was as beneficial for VO2 max (maximal aerobic capacity) as 45 minutes of long, slow cardio performed four times per week. Since VO2 max is generally considered the best indicator of an athlete's cardiovascular fitness and aerobic endurance, this study was a game changer. Interval training is not without its downfalls, of course. Just because I'm suggesting it to build a lean, mean physique doesn't mean you should incorporate it into your routine on a daily basis. In fact, you shouldn't. True interval training isn't a rushed jog—it's balls out. The central nervous system (CNS) is primarily affected by this high-intensity work and takes a minimum of 48 hours to recover. The late Canadian sprints coach Charlie Francis described the CNS like a cup of tea—everything pours into the cup until things start to overflow. Overtraining leads to overflow. If you're overtraining, intervals can tax your CNS and cause muscle damage, mechanical tension, and metabolic stress. Like lifting heavy iron, interval training must be allotted sufficient recovery time. Training intervals once per week can improve body composition along with conditioning levels. If you're looking to really up your conditioning, twice a week is a nice, sweet spot. Barbell complexes have been around for decades. They make body fat run for the hills and can take your conditioning to new levels. They're easy to incorporate into strength-training workouts and can be done at the end for a great finisher. Barbell complexes can also be used to kick off your training, and are very easy to integrate with the corresponding workout in your split. Barbell complexes challenge you mentally and physically. If they're not painful, you're sandbagging! Overload barbell complexes weekly, but in small increments. Ever wonder why strongmen are much leaner than powerlifters? It ain't diet! If you have access to strongman equipment, use it! Go all-out for any of the combinations below and you'll learn firsthand why this method is so effective. The third combination—crucifixes and log lifts—has more of a localized training effect. It'll have your shoulders screaming, and makes a great sequence to finish off a shoulder workout. If you're looking for something without weights, turn to burpees. Long before burpees were established as a jailhouse favorite, this exercise was a fitness test for the armed services in the World War II era. Since intense interval training should be done sparingly and for short duration, walking should never really leave your conditioning portfolio. After all, interval training for over 30 minutes at more than 75 percent intensity can be detrimental to your gains.